Now, if you're a good frother - and I'm sure you are - you've probably looked at all those wonderful Marbles Army Showcases, including the Norse Army Showcase and now you're wondering. How well do these models really go together? Well, I can at least show you some pictures for the main ranges and with God's help, or that of other frother contributors, we will eventually be able to compare all available miniatures. Click on the pictures to enlarge. 1. 3D Miniatures (Andrea) "Camelot" range. 2. Foundry rank & file viking. 3. Gripping Beast rank & file viking. 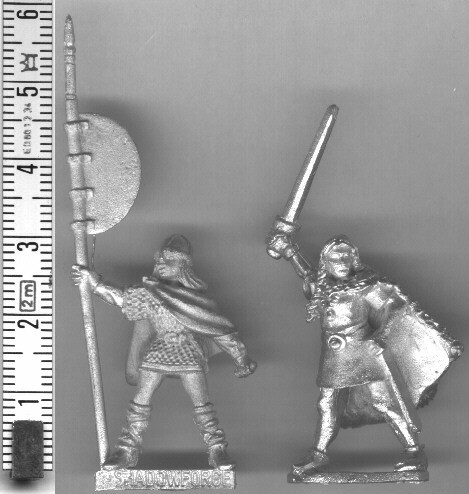 The 3D (Andrea) Miniatures viking (1) is the biggest of the lot, the model in quesion standing at 29mm sole to eye, while a few others from the same range almost reach the stated 30mm. The Foundry and Gripping Beast vikings (2-3) are about the same size and you should be able to mix them in the same unit. Both are between 26 and 27mm sole-to-eye and would about reach the stated 28mm if they were standing straight. Lastly, the DSA Thorwaler (4) measures around 28mm sole-to-eye, which would probably be 29mm if he was standing upright. The Foundry and Black Tree are about the same height. The main reason the BTD viking comes out shorter in the measurement, is because they weren't aligned perfectly when taking the scan. The drinking Dixon comes out taller, but this is more due to his pose than anything else. All three minis are very close in scale and mix without any problems. For the Female vikings we have a Shadowforge Valkyrie and a Foundry Shieldmaiden. As you can see the models are a perfect match sizewise, both measuring almost 28mm sole-to-eye. 3. An Old Glory (Ghost) Valhallan miniature. The figures are aligned for measurement starting from their heels. While there is little point determining the actual length of mounted figures, it is clear that the DSA hornblower is the taller of the three, the Old Glory one the shortest. The maximum difference is only a mm however, so there shouldn't be much difficulty mixing models from either range. The horses (not shown) are similarly close in size, the DSA one being the larger one again, but only in the way that it is more sturdy than the others. The Foundry and Old Glory horses are about the same size when viewed from the side, although a frontal comparison shows the Foundry horses to be broader. For more info on these and other horses, go to the Horse Miniature Comparison page.